Whether you like it warm, iced or chilled, tea can meet any drinker’s needs. While the brother and sister duo Ahmed and Reem Rahim agree that tea is fitting for any occasion, they recognized the need and market for more quality teas. In 1999, in a 750 square foot apartment in Oakland, California, the tea brand Numi was created with super premium, organic 100% real ingredients. • In Shaman lore, Num is the chief celestial spirit; Num has also been referred to as an ecstatic state. • In Latin, Numi refers to a collector of coins. • In Hindi, Numi means taste or fragrance. With various meanings that encompass Numi, it’s fitting that Ahmed and Reem would choose Numi to represent their brand. Ahmed and Reem’s partnership has elevated the line of teas, with Ahmed’s artistic skills and sustainability efforts a central aspect of the production and creation of Numi’s teas. Now as the largest premium, organic, Fair Trade Certified tea company in North America, Numi’s Alchemist, Ahmed Rahim travels the ends of the earths to find unique flavors and pairings while forming partnerships with farmers and to learn about respective cultures and communities. The great aspect of Numi is that there are flavors for every palate. Again, Numi uses 100% fresh, real fruits, flowers and flavors, with variations of green, white, black, herbal teasans, pu•erh, indulgent teas and savory teas. Check out their catalog for an extensive overview of all the flavors offered!Personally, I can’t get enough of the new line of indulgent teas, specifically the chocolate mint tea! Beyond the fact that it tastes exactly like the Girl Scout Thin Mint cookies, pairing the chocolate mint tea with milk to make my own iced latte has been an awesome flavor opening adventure! By using organic herbs and teas, this not only protects the health of farmers, but is more consumer and environmentally friendly. The use of natural, biodegradable, filter paper bags and use of 85% post consumer waste for the tea boxes, allows Numi to lower and offset carbon emissions. Since 2007, Numi has used soy based inks for the printing of its cartons and materials and has decreased landfill usage by more than 82,000 pounds yearly.By celebrating people, planet and pure tea, Numi encompasses all that’s good in the world! As of 2013, Numi introduced its Fair Labor Practices program, which provides adequate labor and workplace conditions throughout foreign supply chain. In addition, all of its pu•erh tea blends are Verified Fair Labor™. On the bottom of each tea box, Numi’s Eco Responsibility Audit shares the environmental footprint. Since 2009, Numi Foundation has focused on acknowledging and addressing the challenges of health, nutrition and education within inner city Oakland, California. The initiative A Creative Transformation In Our Community (ACTION), helps leverage the work of thousands through volunteer project days and encouraging movements. In the future, it’d be great if all of Numi’s boxes of tea came with perforated openings. Only some of the boxes provide perforated openings and it’d be great if all of their products were consistently easy to open. 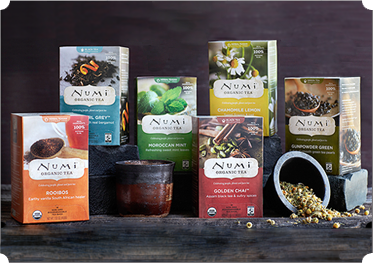 Not sure, but I’m curious if Numi’s teas are in the works to be K cup compatible. I’m impressed by Numi’s dedication to people, profits, planet and product. With its short life span, it’s already a multi award-winning and has left a footprint, don’t worry, it’s small, in the world of tea! I can’t wait to see what new variations of flavors Numi comes up with next! Check out Numi’s Facebook | Twitter | Newsletter | Eco Awards | Foodservice Items pages!